How to create a Free Photo Calendar Template 2019 ? 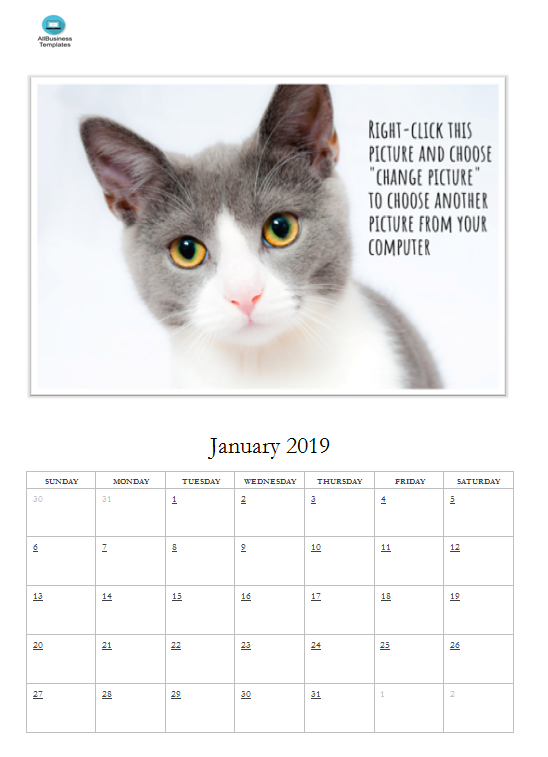 An easy way to start is to download this Free Photo Calendar Template 2019 template now! This template that will perfectly suit your needs! Use our easy 2019 photo calendar template to create a personalized calendar with your own photos. Your photos will look beautiful in this sleek and elegant template. All you need is Microsoft Word and 12 photos. Adding your photos just takes a few clicks. You can use this 2019 Word calendar template to make wonderful gifts. Each year my I make a calendar with photos of all my family members and give them as Christmas gifts to family. It’s lovely to see smiling faces on the wall and think of my family members each time I walk past. I created this page so that you can download my template and create your own personalised photo calendar using your home computer. All you need to do is pick 12 great photos, download the 2019 Word calendar template, and follow my easy step-by-step instructions. Print it out on your home printer and hey presto you have a thoughtful and inexpensive homemade gift! I’ve taken care of all the formatting for you so there’s no fiddling with tables or dates. All you need to do is add your photos and your calendar will look great! Now we provide this standardized Free Photo Calendar Template 2019 template with text and formatting to help you finish your document faster. If time or quality is of the essence, this ready-made template can help you to save time and to focus on what really matters! Our Templates have helped many people to reach the next level of their success. Don't try to reinvent the wheel every time you start to work on something new! Instead, download this Free Photo Calendar Template 2019 template now for your own benefit! And after downloading you can craft and customize every detail of its appearance very quickly.